A chiched, illogical mess. Even fans of FX films should be disappointed, as all the fight scenes are set during rainy nights, making this visually incomprehensible. It's time to tell the truth about Del Toro: his work is mediocre at best. Won't appeal to people who are not already into this type of stuff. I don't understand why the robots, that do most of their fighting in water, look humanoid? Also why do they do they mostly do hand to hand combat when guns are available? Boring. Good special effect but thst's it. Thank gosh I listened to a few friends. Totally predictable and a mesh of Independance Day (connecting to the aliens and seeing their plan), Iron Man (but in giant form), and Godzilla. The creatures were unique but why, oh why, did the giant iron men have to wait for their big guns to fire and hope they kill the creature?? The only thing that worked underwater and everytime (strangely as a last resort) was the swords!! If you have over 2hrs to kill mindlessly then go for it. BAD ACTING to the max. This movie kept me on the edge of my seat, it was jam-packed with action, and I just can't get enough! I can't wait to see if another movie comes close to topping this one in the next couple of years - A difficult battle indeed. awesome movie, the haters here just don't understand what a good movie is. This movie rocked and I'm glad to own it on blu ray dvd combo pack. Hell, if you want a bad movie, go watch the purge or the bling ring, those are the worst ever, boring and stupid. Go Pacific Rim! I love Charlie Day! He's hotter without a beard! Probably the worst movie i have seen this year. the storyline didn't make any sense and Jurassic Park had better visuals than this. This movie was a complete waste of time. So disappointed!! The movie was original in its action and the action never stops If your looking for an acadamy award winner this isn't it if your looking for fresh and dynamic what a movie. Disappointing.You must be kidding. Japan's cartoon into movie. An unexpected surprise. Suspend disbelief for 2 hours and become a 10 year old boy with a toy robot in his hand again. Big, brash and fun, with just enough plot and background to satisfy, good pacing and a nice mix of characters. Special effects are beyond reproach and the sets are massive and detailed. Tons of fun. 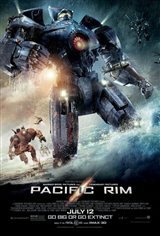 Don't think too hard, don't look for plot holes, grab some popcorn and watch monsters get the crap kicked out of them by giant robots. No really offensive language or love scenes to make parents feel awkward either. This film should be seen on a big screen. What a romp! As a pure action flick, I would have given it the full 5 stars. As a regular movie, however, the acting is simple and appropriate, but the plot and characters are somewhat formulaic, so it offers few surprises. So I am only giving it a 4 star rating. amazing visual and special effect, i was in awe of how we could make movie like this. An extraordinary film that was not so pretentious to play a monster vs robot theme too seriously. The humor made all the impossible stuff digestible. No other director could have pulled off this plot theme so wonderfully. Not to mention, a spectacular thrill ride. Thank you Del Toro! It was ok...kinda loud and headache inducing, but I was expecting that. Pretty much like watching Transformers meets Godzilla. I like the 'daytime' creature shots (what few there were) and wish they would have done more of those. The nighttime fight scenes in the rain were hard to follow in some parts. Oh, and I liked the girl, she was really cute! So, Hollywood...we all get that you can do amazing CGI, but please, can we see something different now?? Thanks! lots of action. special effects are great! bored as hell...I dosed off a few times and my friends have to wake me up and that's how bad it was. Ironman meets Godzilla via Independence Day... A fairly entertaining movie, with cool visual effects. It is ok for kids, for grown up it was boring. Not that great. Pretty boring, actually. A damn fun original summer film amid all these sequels. The fact that grown-ups 2 made more money last weekend is an embarrassment to the movie going audience. WTF is wrong with you? Great story, great characters and great giant robot vs. giant monster action! Really enjoyed this and if you like a great action flick, go see this! I too enjoyed TO CATCH A THIEF! You can't go wrong with Hitchcock! I just hope the video game looks as much like a video game! Quite possibly the worst movie ever made with atrocious acting and cumbersome plot. Great movie! Loved the 3D, must be seen in the theatre. If you love action with Monsters vs. Robots (Japanese movie). You will love this movie. Guillermo is a genius, I was on the edge of my seat with all the action scenes. The story was original and great acting. I will see it again for sure. Best video game of the year so far! the best action movie I have seen in a while, very entertainin. Solid story, acting and action sequence. I had more fun watching this than man of steel! Neat idea. Nice visuals. Bad acting. Worse dialogue. No good looking women. Nearly unbearable. Thank God I didn't pay for 3D. Lots of action & also a pretty decent story about the characters. It’s dark & seeing it in 3-D does make it somewhat more difficult to see details. The fights start right away so you don’t have to wait long to see the Kaiju (the monsters) You can see where they spent the $190 million. A mindless summer popcorn movie.. kind of fun! I'd give it 7/10!